1. Material: STAVAX, this material comes from Sweden, and its brand name is famous ASSAB. About materials, we are customized according to the customer's drawing requirements. 2. 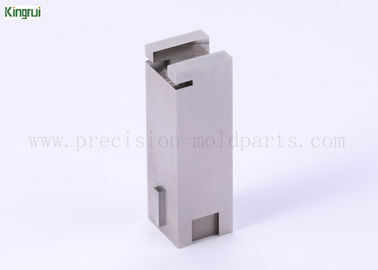 Machining: For the CNC machined parts, there are two main processing steps: grinding and discharge machining. These two processes are part of the process that we are most adept , if you have the demand, please sent your drawings to us. PVD coating and more. All will be done according to your requirements. 6. Product weight: It depends on your drawings. H13, S- 7, PD613, STAVAX, M310, SKD61, DC53, etc. 1. Experience of machined: Since the establishment of the factory, more than 11 years, Kingrui has been careful in the processing of precision mold parts and CNC machines components. 2. Machined technology: After 11 years of training, Kingrui has excellent processing power, especially in grinding and discharge machining. In addition to these, CNC milling, wire EDM, internal- external lapping and other processes can be available in our factory. 3. Price: About the price, we are calculated according to your drawings, and your parts are directly customized in our factory, no middlemen, less cost.